If you've been searchng waterfront real estate for any length of time you'll no doubt come across the term "Shore Road Allowance" or "SRA" in MLS listings and property write-ups for cottages & vacant lakefront. 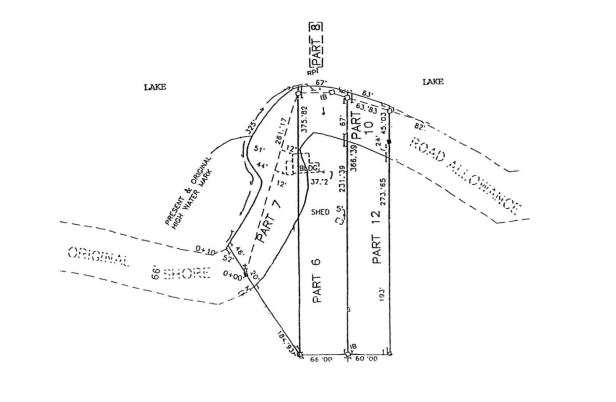 It's generally comprised of a strip of land 66' wide between your property and the lake or river it faces. As a waterfront property owner in Ontario you have what are known as “riparian rights” to the shoreline. What this means for example is you can have a dock (with the correct permits) and enjoy the use of it without owning the S.R.A. Way back in the mid 1800s the Ontario government created the Shoreline Road Allowance to allow access to the shore from navigable waterways for business and public passage in a era that travel by lakes and rivers was used prior to the road systems we now enjoy. Even though they were created, many of these ‘roads’ were never opened but keep in mind that even today this in no way limits the original conveyance nor obstructs the right of use by the public. The public has the right to use it anytime. Consider the following scenario; You've just purchased your dream cottage on Lake Muskoka complete with matching bunkie and beautiful sand beach. The first day a group rides up in their boats, ties up at the beach and spends the day. As long as they stay on the SRA they're within their rights. Some boat houses were built years ago on the SRA, many with no permits. If you're considering purchasing a cottage with a structure close to the lakefront be sure to have a lawyer familar with the area check it out. In most cases you can lease the land from the township for a reasonable annual fee but a little due diligence may save a world of hurt. Ontario's "Big Three", Lake Rosseau, Lake Joseph and Lake Muskoka have their own provincial rules for the owning / leasing the waterfront so it's particularly important to thoughly investigate before you purchase or build. Keep in mind that the north end of Lake Rosseau and Joseph is Parry Sound District, not Muskoka. In the Township of Seguin and Muskoka Lakes have very different rules when it comes to waterfront construction. Ahmic lake is simular with the Township of Magnetawan allowing boathouses with living quarters and on the Ryerson side of the lake you are not. Increasing property size. Sometimes you're at the "Maximum Coverage Area" for your lot. The additional square footage added to your property when you purchase the S.R.A could possibly allow you increase your cottage footprint or build a garage bunkie. If you're considering building boat house you will most certainly need to buy the S.R.A from the township. Start the process early! It can take 12 -18 months depending on the municipality so it's prudent to get your ducks in a row as soon as possible. Cleaning up title. If you're pondering selling your cottage and it has a structure within the S.R.A. things can go much smoother and the property can be more attactive to potential Buyers if it's owned. At this point it's relatively inexpensive to purchase and most townships and they're quite willing to accomadate but this could change at anytime. To purchase your Shoreline Road Allowance, referred to as “closing your SRA,” there are several steps. Every township has their own guidelines but the process is simular in most districts. As well, the Ministry of Natural Resources has guidelines affecting closure of some roads for the preservation of wildlife and fish habitat. We highly recommend consulting a lawyer familar with the process! To close your SRA, you will need to make applications and are responsible for the costs that are determined by the municipality. The purchasing and closing costs will vary but at this point in time are quite reasonable. The MNR must agree to the disposal of shore road allowances, as well as the township and sometimes adjoining property owners. There is no standard fee for this land as each municipality has the right to set their own price usually on a "per square foot" basis. The applicant is responsible for all costs associated with the purchase including surveys, application fees, town legal fees, etc. We can give you contact information for lawyers familar with the process, give give us a call. Searching for waterfront in Muskoka Parry Sound? Click here for new cottage listings.